It started at 3AM. Explosive light! KABOOM!! Lightning that close can rattle your brain! The heavy rain that followed had me dreading packing the car up. We are not travelling light and all our expensive gear gets carried into the room every night. By 5AM, our departure goal, the rain had moved on and stars were overhead. Whew! As we drove toward Yellowstone the Tetons were ahead of us and it was soon apparent that the storm had move west and was now behind the Tetons. 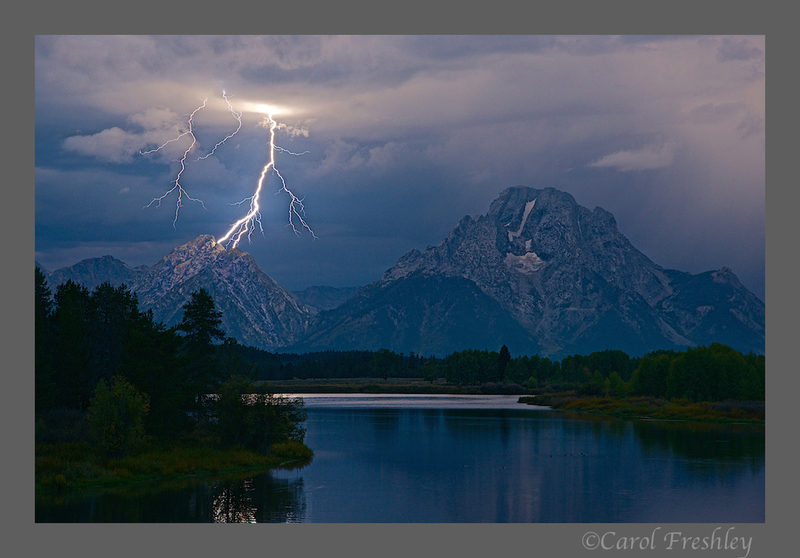 Lightning was frequent and really lit up the mountains. STOP!!! 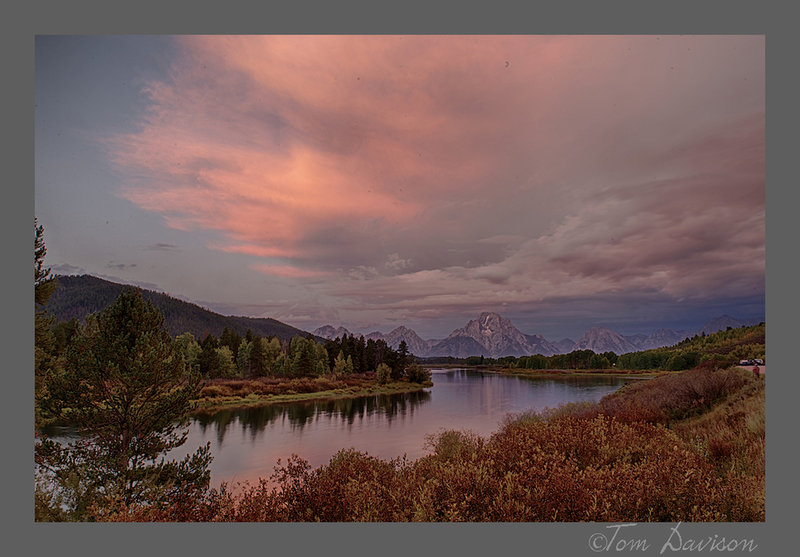 So Oxbow Bend became our morning shot. We were early and got a good spot. Later you could not buy a parking space at any price. As the sunrise replaced the storm, Oxbow once again took on a new look. There were so many people down by the bank of the river. Quite a crowd! I am thinking of selling warm breakfast burritos out of the back of the Prius while Tom shoots!! After breakfast at the Jackson Lake Lodge we headed north. The northern edge of the mountain range is not so dramatic, but it appears the lake goes a lot further north than we thought. Reflections were interesting. By now we have caught up with the storm and we stay with it all the way to Livingston, MT. As we went through Yellowstone I kept thinking how very different it was from the Teton National Park and the two parks are not that far apart. The Tetons seem majestic and imposing. Yellowstone is otherworldly. As you enter from the south, your first impression is of streams and waterfalls. Tom got a different take from the same location. Shooting at the waterfall canyon wall . . . He went sideways on me!! It was raining really hard and he took it quickly. I felt he would lose too much of it if he straightened it. I love it so much I am keeping it. We stopped for lunch just in time for Old Faithful to display her power. Tom took this image from the second floor balcony of the Old Faithful Lodge. After lunch we got into the hot pools, paint pots and prismatic springs. My healthcare background came into full play here. These are sores!! Get out a big bandaid and powerful salve. The land steams from unexpected places, even high up in the hills and along the road. The steam smells like sulfur and creates micro-environments where bacteria and algae grow, creating color and scale. With the ever present foreboding storm in the background, we looked for patterns in the sky that would indicate a space for sunlight to emerge. How about a litttle action? Recorded with Nikon D800 and processed in Final Cut. I tried to capture lightning and so set my camera for longer exposures. There was lots of lightning behind this scene, but no dice on a capture. I did, however, get some interesting long time exposure time 'looks'. We were getting tired of driving in the rain, wiping cameras and tripods dry, slow traffic . . . but . . . one more loop. It just might be worth stopping and snapping a shot. By now we were hand holding and just getting a quick one in. Hahahahaha! Without our support group close at hand we are out of control!! We were between major deluges where we could see dark ahead and darker behind us. But, don't you think this is a pretty bubbly pot? Finally, the most fun image . . . Tom loves fonts and lettering. He admits he does not stink at ink (he doesn't) and as an artist he appreciates a good neon sign (nostalgia kicks in too). Heated units? No mention of wifi. We gave in!! Support group called. Where are you? Far away from night's lodging reservation! "Get on with it"' they instructed. We arrived in Livingston, MT in time to get a pizza and go to bed. It was raining this morning. We have strategically (get the humor here) planned for the next several days and done some laundry. We are headed to Glacier National Park this afternoon via Missoula. Escape from your support group and get out and shoot! We are having an unbelievably great time and hope that our photos make you feel like you are part of our journy.